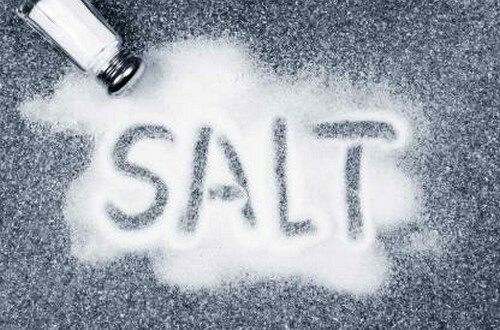 To understand why salt can be both good and bad for us, we need to go back to basics with a very quick science lesson. Ready? Then here we go. Salt – or sodium chloride to give it its full name – is made up of two main elements. Sodium and chloride. However it also contains many other naturally occurring trace elements such as calcium, magnesium and potassium. The main function of sodium is to help the body regulate blood volume – and so blood pressure – by ensuring that the level of water within the blood is maintained at an acceptable level. This is done by the kidneys which monitor levels of sodium in the blood. A message is then sent to the pituitary gland in the brain, which controls the release of a hormone known as ADH – anti diuretic hormone. As the name suggests, ADH controls the amount of water being removed from the blood by the kidneys. When ADH is released, MORE water is retained in the blood, so less is urine is produced. ie, it's anti diuretic. When it stops being released, LESS water is retained by the blood and more urine is produced. If we now take it one step further, you can see how fluctuations in levels of sodium within the blood trigger these changes. Where levels of sodium in the blood RISE – meaning there is LESS water in the blood – ADH is released by the pituitary gland. MORE water is retained within the blood, so that the volume of blood INCREASES and the level of sodium FALLS back to normal. Conversely where sodium levels in the blood FALL – meaning there is MORE water in the blood – ADH stops being released by the pituitary gland. LESS water is retained within the blood, so more urine is produced. Blood volume FALLS and the level of sodium RISES. While it may sound like there are big swings in sodium levels – and the amount of water in the blood – in reality these changes are very small. ADH helps ensure that the blood’s composition and volume is maintained within a very narrow range so that the body can function as normal. For completeness we should mention that water and salt can also be lost through perspiration. However unless this is excessive – due to hot temperatures or physical exertion, leading to dehydration – this has little impact on the volume of blood or function of the kidneys. If the kidneys are unable to maintain sodium levels, the only way to bring them back to normal is to INCREASE the amount of water being retained in the blood. This leads to blood volume increasing, which exerts additional pressure on the blood vessels and heart. As a result, the heart has to work harder to pump a greater volume of blood round the body. And blood pressure rises. Arteries can then become clogged up or blocked, which reduces blood flow to the tissues, particularly the brain and heart itself. Where the diet is high in salt, the kidneys can become exhausted by the additional work needed to maintain sodium levels within the blood at normal levels. This reduces their efficiency, leading to a downward spiral of reducing kidney function along with the risk of stones forming in the kidneys or bladder. Given all of these risks, it’s not surprising that a low salt diet has been recommended as a way to avoid – or minimise – problems occurring in the first place. However, there is a fundamental flaw in this advice. This is that the substance most people think of as “salt” – white table salt – is a highly refined and processed product. Worse, it’s devoid of all the other elements or nutrients found in natural salt. More about this in a minute. Just to make compound matters further it also contains anti caking agents – to make it pour easily – as well as other chemicals to maintain its colour, consistency and shelf life. And, if you’re really unlucky, it may also contain an aluminium derivative as well. As an aside, in the early part of the 20th century, Doctors started noticing that those who used white table salt started to suffer chronic degenerative diseases. These included goitre, caused by a lack of iodine in the salt. This led to iodine being added to many table salts, although in a form not easy for the body to assimilate. By contrast, a full spectrum – or natural – salt such as himalayan pink crystal salt, contains the full spectrum of 84 minerals and trace elements. This unprocessed raw salt is hand-mined from salt caves formed over 250 million years ago, as ocean salt settled in geologic pockets around the earth. It provides all the minerals and trace elements the body needs to function, without any of the health problems associated with white table salt. Sea Salt comes somewhere between white table salt and himalayan pink crystal salt, depending on where it comes from and how it’s gathered and processed. This means that you need to do a little homework before considering whether to buy it. Sadly many products described as “sea salt” are anything but natural, they’re just in a less processed form than white table salt. The good news is that there’s an easy way to check how natural it is. This is simply to look at its colour. White salt is just like white sugar. Highly processed and missing all the minerals and nutrients the body needs, regardless of what the label may say. As usual it’s quite simple. Yes, we completely agree that adopting a LOW WHITE SALT DIET – or eliminating it altogether – is an important step. And one that can be done quite easily, by simply removing processed and convenience foods from your diet. That way you know exactly what you’re eating. This just leaves a little label reading on any other processed products you may still wish to buy such as baked beans, condiments and the like. If you still want to use salt in cooking at home, use sea salt – having first checked the label and colour (!) – or himalayan pink crystal salt. As an alternative, you could also consider using herbs to season your foods, rather than automatically adding salt.